Who's ready to fall in love with frizzles? Here's more photos from the shoot for my new chick starter. . These chicks are so friendly! They loved posing for the cameras. . The first thing they go for are the herbs in their feed, and I think it shows because their feathers get more curly by the day, lol. My duckling looks like he's getting old man eyebrows, but he/she is just losing down. Their feathers are coming out! . We've had a cold snap, so even though they're out in the coop, they have to come in to my cabin office at night to keep them safe. They've been getting lots of shrimp (link in the photo) to make up for it. . We've also started on our duck pond (swipe left to see). It's not much to see now, but it will soon! Picked up this little cutie at @tractorsupply last week! She (I'm keeping my fingers crossed it's a she) is a Silkie, and so adorable. . Her toes were curled for the first week. She got "boots" to keep her toes flat, and LOTS of my high protein chick starter with herbs (oregano, garlic, and lemon balm, available now on Amazon). . She's still tiny (she IS a Silkie) but her toes are straightening out, and she's walking more soundly thanks to some TLC. ♥️♥️♥️ . What should I name her? 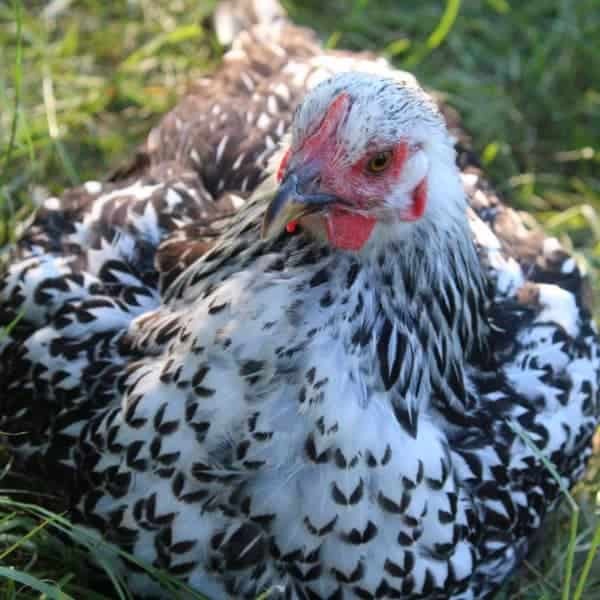 When he was about 5 months old, this guy (leghorn/bantam Cochin mix) had a crooked foot for about 2 weeks. . I'm not 💯% sure why – I noticed he was limping and his foot was crooked. . I put him in a dog crate and fed him Fluffiest Feathers Ever! and my layer feed (roos can eat it too) because they're high in protein and have herbs mixed in. . After a couple weeks, he still walked with a wobble but his toes straightened out. . Within a month, he walked fine. . Now, he runs everywhere (and bothers the hens CONSTANTLY). . He's still pretty short (he IS a bantam) but he has a lot of personality! My chocolate cuckoo orpington is one of the sweetest chickens in my coop. . Nothing seems to bother her, and she loves being held. . I think this is a great breed for kids. They're fine being held, and they don't flap and squawk like a lot of other breeds. . Which is good, because I with two kids with sensory issues, flapping wings can get overwhelming! . What's your favorite breed for kids? This is one of my favorites blends: BreatheRight. It's full of herbs traditionally used to support healthy breathing – herbs like peppermint, mullien, and more. . Even though we're adding windows to my coop for extra ventilation, I like to make sure the hens are supported, especially as weather gets hot. . I personally don't use herbs from the grocery store – there's no telling how old they are (they could be years old!! ), or what kind of conditions they were grown under. . After cleaning the coop, I mix BreatheRight with their nesting box herbs and the shavings in the coop. . The chickens love it! This little guy is cute, but a total jerk! He's been attacking my legs again lately. . I'm honestly not sure why – he doesn't have a prayer of getting to the hens, and doesn't even try! . But he sure loves his treats! Lol! . He's taken to staying in a nesting box. I don't think it's out of sympathy for the hens. . I think he likes the nesting herbs and that it's quiet.